Therapy, also called psychotherapy or counseling, is an activity by which you meet with a therapist to work on problems in your life. These problems can be wide ranging from relationships, behaviors, life decisions, traumatic experiences, bereavement as well as bodily symptoms such as panic. Therapy may also be used by people seeking self-improvement and growth unaccompanied by any specific problem, because you just want to be the best version of yourself, whether it’s seeking life purpose or seeking to understand yourself better. Ultimately beginning therapy can be a big step toward being the healthiest version of yourself and living the best life possible. This activity of therapy is primarily based on talking to explore thoughts and feelings in relationship with the therapist who is skilled, through training and experience, in helping people resolve these types of problems. Therapy does not offer medication or diagnose mental health issues, although those maybe sought alongside therapy through a psychiatrist and/or a psychologist. The therapist may use a variety of tools or techniques based on their own training and skills to help you during the process. There are a number of types of therapy types (modalities) of therapies which therapist have trained in such as CBT, Person Centered, Psychodynamic, Existential or Integrative. Although these modalities differ in theoretical approach they all agree that the relationship between the client and therapist is the most important factor for a good outcome. 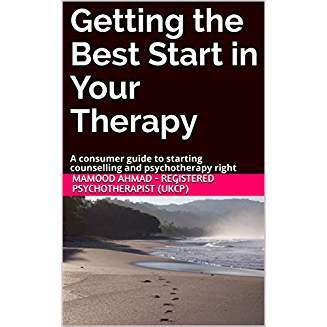 In general, unless recommended otherwise or you have a strong preference of modality, you should make a selection of the therapist based on their experience in working with the problems you have and whether you feel you can establish a good safe relationship with them. Being safe means feeling the therapist cares, accepts you as and is non-judgmental. Therapists may also have specialist training and experience to work with individuals, couples, families or groups. You should ensure your therapist is licensed (US) or belongs to a reputable membership body (UK) depending on the country you are in. Therapists may require a formal license through the government to practice in some countries while in others there are voluntary membership bodies (UK). A voluntary membership body provides a level of protection to clients because they verify reasonable standards of practice, such as qualification, insurance, ongoing development as well as a complaints procedure. The journey or process of therapy simply means the activity, steps, thoughts and feelings that you go through in therapy, from contemplating therapy, selecting a therapist and of course within therapy and to a point where you have overcome your primary concerns. It is not uncommon for people to feel confused, unsure, stuck and thus have questions or concerns during the process of therapy. If you have a therapeutic process question feel free to email us as we maybe able to offer a few pointers which could alleviate any concerns or conflicting feelings that you’re experiencing within therapy.